Foodbank provides an emergency 3 days supply of essential, non-perishable food to people in crisis. It works through local voluntary centres which supply food boxes on the production of a voucher issued by a local caring agency, eg Social Services, Doctor’s Surgery etc. There are currently nearly 400 foodbanks in the UK being co-ordinated by the Trussell Trust and the aim is to have a Foodbank in every town. Food is donated by members of the public. Many churches in Greenwich are collecting food and have clearly labelled boxes so that items from the list (see left) can be easily dropped. Food is also received from other sources such as supermarkets. The food is sorted by volunteers and distributed from one of the Foodbank Welcome Centres. 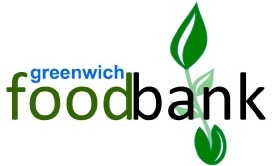 There are currently eight Welcome Centres which operate in Blackheath/Charlton Kidbrooke, Plumstead, Eltham, East Greenwich, Thamesmead and Woolwich. For details about locations click here. . . There are four ways that local churches can support this exciting project which is seeking to demonstrate God’s love and the care of Christians to people who are in crisis and need a little help. Further details from Alan Robinson. Click here . . .